I have not updated the blog for a few days. 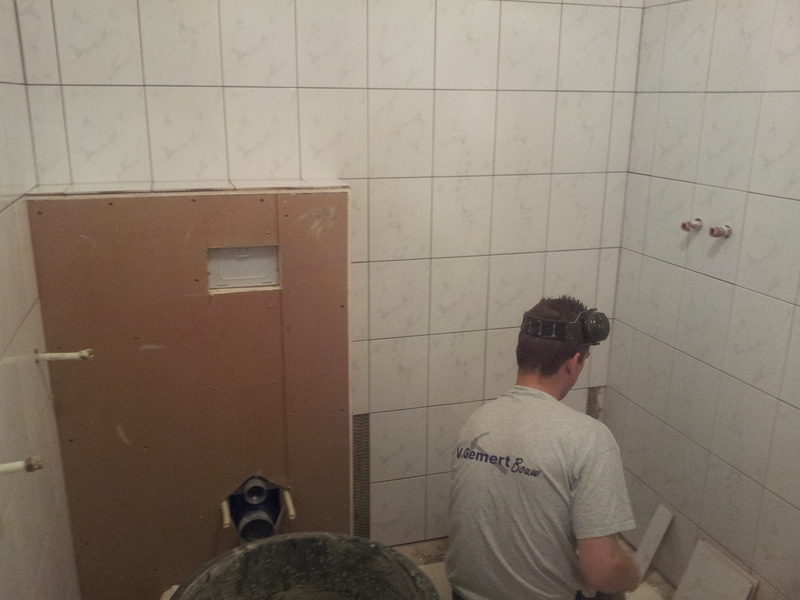 Koen has been here for most of the time doing the tiling of the walls and the floor. Day 7 he did build the box for the toiletflush and finished the tiling of the wall. When done he grouted the tiles (called washing in). We decided for a silverwhite colour grouting for floor and walls. White grouting would be too much white. I wanted be able to see the tiling texture on the wall and this colour gives it just that tiny bit more. On the floor it may look slightly different but it is the same colour. The reflection of the light will be the cause of the colour difference. In the evening I did feel rather tired and decided to make an easy meal. I had some leftovers from the evening before. 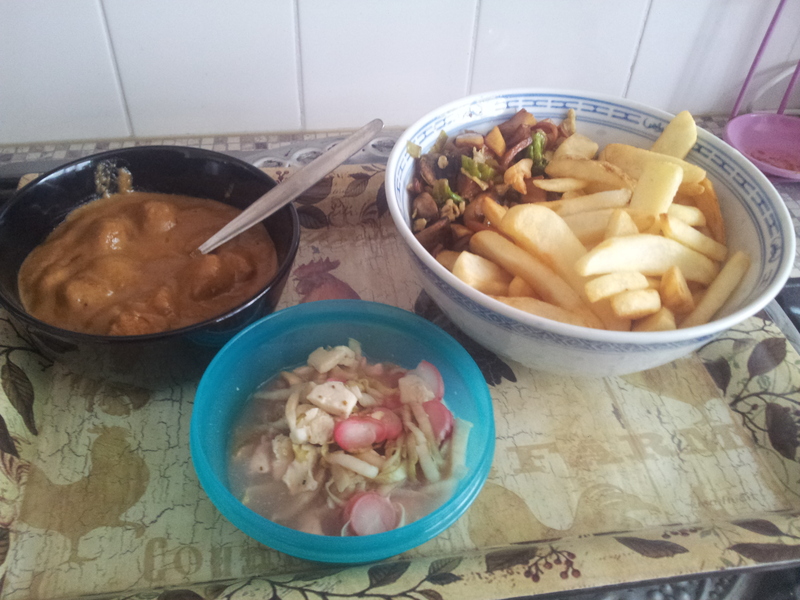 Mixed vegetables prepared in the wok with chips, mixed salad with chicory, mozzarella and radishes from the garden topped of with a vinaigrette. For meat I had small bits of chicken covered with a peanutsauce (called satesaus). That was 10 minutes work for a decent meal. Day 8 Koen worked on the floor and it all is starting to feel a lot cleaner in that room. The dirt and grit disappears and we are getting more and more excited over the endresult nearing its completion. We also feeling more and more gritty/grubby. Not being able to have a decent shower is starting to take its toll and I can only think about having a nice shower. Koen tells me he managed to get the plumber in for Friday afternoon, so we’re one day ahead of schedule now. This means we can have a shower a day sooner, that is great news. To celebrate this we are having a bottle of wine that evening. 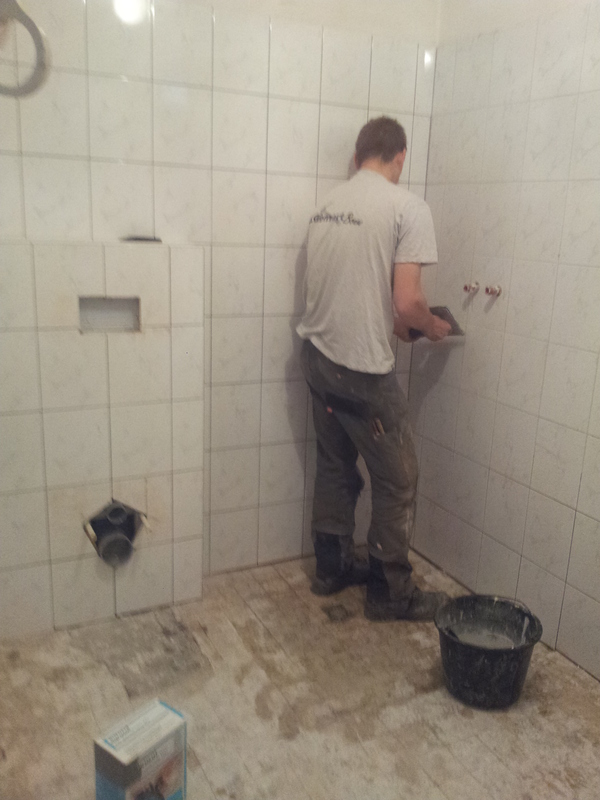 It’s now day 9 and he is working upstairs at this moment fixing the shower cubicle and the sink unit. He has done the grouting of the floor and excitement is rising here. It’s starting to look great. I will upload the pictures later for you to see. Don’t want to spoil it too soon. Stay tuned. 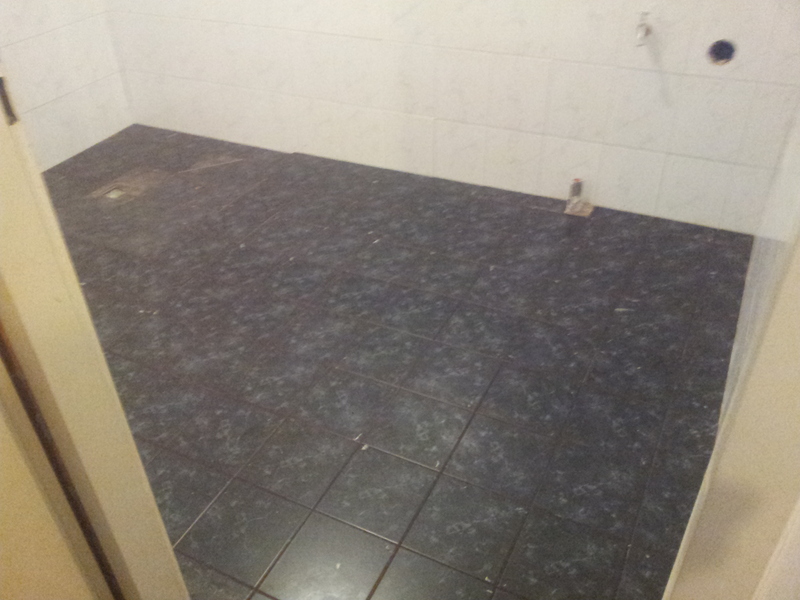 This entry was posted in House DIY, What's happening and tagged bathroom, contractor, floortiles, food. Bookmark the permalink.